Next SUCH AS DECAPITATION BY WINDOW BLIND? 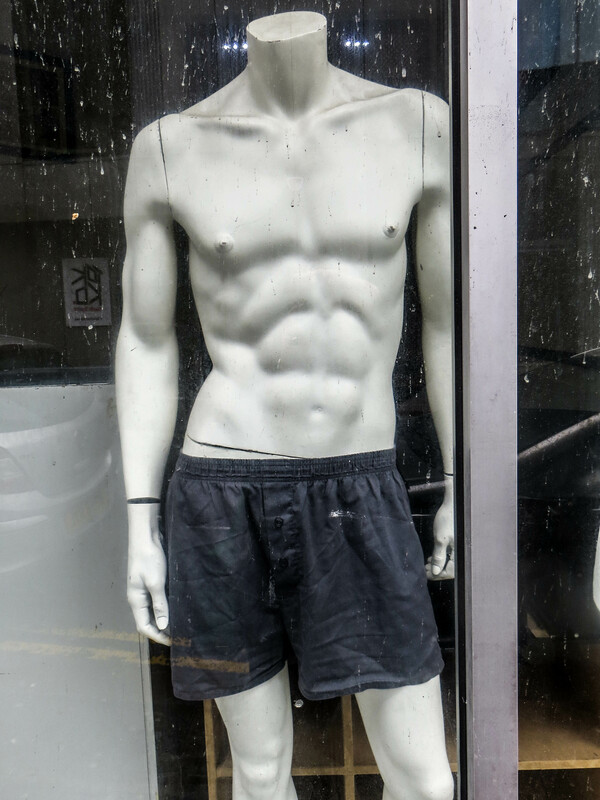 Of course the shop is empty but that makes this even sadder somehow especially as the boxer shorts are so tatty. Thanks for coming by. They either had a good laugh, or they secretly think that mannequins have feelings. I like to think they thought he had feelings – the Twilight Zone….thanks for commenting. I know – a statement perhaps? As long as it doesn’t come to life like those mannequins did in Christopher Eccleston’s first episode of the new Doctor Who! Not another Who follower! Mark loves it. As a kid, I never got into the original series (although I would certainly love to rectify that). I really only jumped on board with the newer one with Mr Eccleston, Tennant and Smith. Can’t wait to see what Capaldi’s Doctor will be like! Must’ve cried his head off at the news of closure! I don’t know what’s funnier… the photo or Chris Nelson 61 comment. Hahahahahaha! Chris, have only just seen your comment! How ill- mannered of me…..cos it is a cracker! Glad you approve! To be honest I hadn’t noticed that you’d not replied! Not as important as I thought I was! You take care too. Not true at all! It’s not difficult to miss things – you know how much I enjoy both your posts and comments. Or, perhaps the sales people were too busy behind the counter trolling through their facebook feeds that the point was to keep customers away?